The parable of the blind men and the elephant is used to illustrate how biases can blind us, preventing us from seeking a more complete understanding on the nature of things. It is often used as a warning against the promotion of absolute truths. The story of the blind men and an elephant originated in India (Pali Buddhist Udana) from where it is widely diffused. Made famous by the great Sufi master Jalal ud-din-i Rumi (1207-1273 c.e.) in his Mathnawi of Jalalu’ ddin Rumi, the parable has been used to illustrate a range of truths and fallacies. At various times it has provided insight into the relativity, opaqueness or inexpressible nature of truth, the behaviour of experts in fields where there is a defecit or inaccessibility of information, the need for communication, and respect for different perspectives. Although the parable’s function is to call attention to a lack of objectivity and consideration of other approaches and perspectives when trying to understand the nature of things, we do have to warn that not all perspectives are equally valid, and even valid arguments are not necessarily equally sound. I would like to thank Dr. Peter Kabai for this reminder. Each of us lives in our own world, with our own life experiences and sensory perceptions, which often lead us to biases characterized by a lack of general objectivity, open-mindedness or the consideration of the points of view of others. In a world where issues are usually and uncritically two sided: black or white: good or bad; ethical or unethical, it is easy to fall into heated debates, each defending a point of view often times equated to truths. 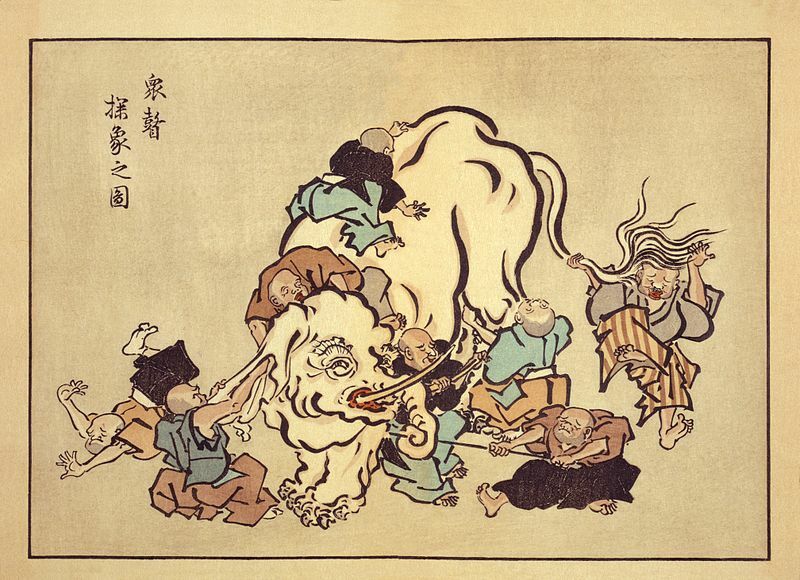 The elephant in this sense represents reality, and each of the worthy blind sages represents a different approach to understanding this reality. In all objectivity, and in line with the poem of John Godfrey Sax, all the sages have correctly described their piece of reality, but fail by arguing that their reality is the only truth. Unless we can piece together the realities of the sages we can in no way be objective and we will fail to understand the whole elephant. How can anyone describe the whole until he has learned the total of the parts. There are many versions of the parable and differences are mainly in regard to what body part is touched and described, here a common denominator; a group of blind sages (or men in the dark) touch an elephant to learn what an elephant is like. Each one feels a different part, but only that one part, such as the tail or the trunk. They then compare notes and learn that they are in complete disagreement. Brilliant explanation of this tale – I have linked it to a post I just wrote! Thanks for your wise thoughts! Is this what you got from all of this? Let me show you how smart I am? There’s a message here that transcends grammar and spelling. -1 for the spelling error. -25 for not understanding the message. Good Lord. Do you really need that much attention?